Although it has been recognized as a key parameter of wood quality and a good source of information on growth, annual wood density has been little studied within diffuse-porous trees such as beech ( Fagus sylvatica Liebl.). In this paper we examine the variability encountered in beech ring density series and analyze the influences of ring age, ring width, climate and between-tree variability on density. Thirty ring sequences were sampled from 55-year- old dominant beech trees growing within the same stand; ring density and width were measured using radiography. Ring density proved to be less variable through time than ring width. The relationship between these two variables was less than observed in ring-porous trees and it showed great variation between trees. The sensitivity of ring width and density to climate was also different; width was strongly linked to soil water deficit whereas density was correlated to temperature and August rainfall. Unlike ring width, wood density showed sensitivity towards climatic characteristics of the late growing season. A large part of annual density variability remains unexplained, even using advanced modelled water balance variables. We hypothesize that a significant part of the tree ring is under internal control. We also demonstrated great inter-tree variability (the tree effect) in ring density, which has an influence on density but not on trees’ response to climate. 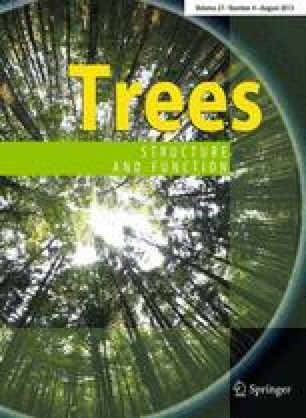 The authors are grateful to the French Forest Management Service (Office National des Forêts) for allowing the sample of trees, and to P. Behr, P. Gelhaye, F. Gérémia, C. Kieffer and R. Schipfer for their technical support. We thank F. Mothe who provided X-ray analysis software and helpful advises. We also gratefully acknowledge A. Granier for supplying water and carbon balance simulations and for his constructive comments. The Ph.D. student, O.B., received a grant from the French Government (Ministry of Research).